Put the porcini mushrooms in a bowl, cover with the water and leave to soften for 20 minutes. Drain, reserving the soaking water. Strain the soaking water through a coffee filter or a fine sieve into a large saucepan. Squeeze the mushrooms dry, then roughly chop and set aside. Add the stock to the mushroom liquid in the pan and bring to a gentle simmer. 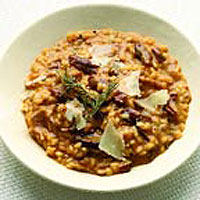 Maintain over a low heat while you prepare the risotto. Pour the olive oil into a large, heavy-based pan over a medium-low heat. Add the onion and cook for 6 minutes or until completely soft but not coloured. Turn up the heat and stir in the rice. Cook, stirring, for a minute, then add the wine and let it bubble and evaporate. Add the chopped mushrooms, dried rosemary and a ladleful of the hot stock and stir until the rice has almost completely absorbed the stock. Continue, adding the stock a ladleful at a time, until most of the stock is used and the rice is cooked but maintains a firm bite. This will take about 20 minutes. Turn down the heat if the risotto bubbles too vigorously or begins to stick to the pan. Add some of the remaining stock and stir until you have a wet, but not sloppy, risotto. Don't worry if there is a little leftover stock. Turn off the heat and stir in the butter and Parmesan. Cover for a few minutes, then stir again and adjust the seasoning. Add a drizzle of truffle oil and serve, garnished with shavings of Parmesan and a sprig of rosemary. This recipe is taken from WFI contributor Jacque Malouf's new book, 'Mushrooms' (Conran Octopus; £12.99), which features more than 70 inspiring recipes for fungi.